Your address in the sky. With a charm of smart luxury, Conrad Osaka was established in June 2017. A motif of the wind and lightening gods welcome you to the lobby on the 40th floor. Your special trip begins the moment you set foot into the hotel. 389 unique pieces of art are found throughout the hotel depicting wind and light. All rooms on the 33rd floor and up are more than 50 meters and have a modern Japanese interior. You can gaze out through the window for a panoramic view of the city. If you have your heart set on luxury, we recommend our Executive rooms and suites. 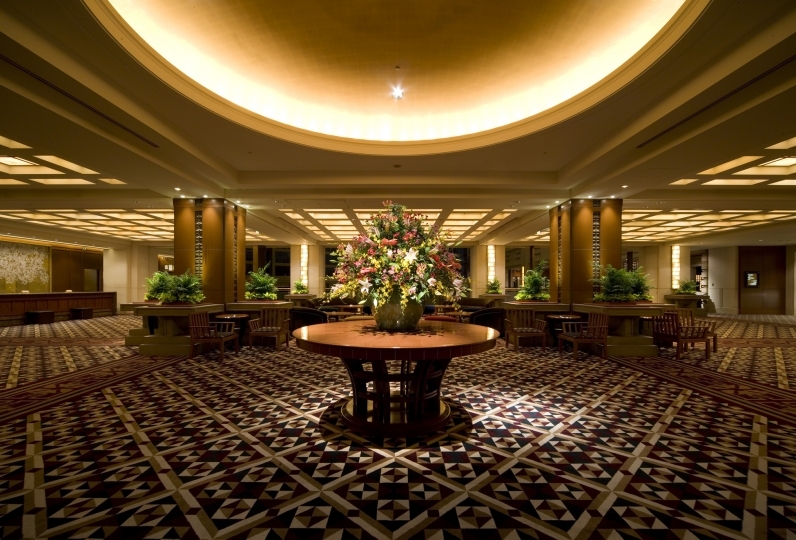 You get access to the exclusive Executive Lounge and its facilities. Enjoy breakfast, afternoon tea, or a cocktail in the evening. You can even check in and check out here. Come visit The Kitchen of the Nation (Osaka's nickname). Enjoy the creations from our open kitchen in a small, private setting or buffet dining at one of our four restaurants and bar. The spa floor promises to make your stay in the city special with its 24 hour fitness gym and indoor heated pool with a view. Experience Conrad Hotel's dream-like qualities. To be honest, the impression of Conrad Tokyo was not very good (Gomenasai! ), But I was not expecting it there, but it was betrayed in a good sense. I was amazed at the Ritz-Carlton Tokyo where I had a wedding ceremony, but it was the same kind of hospitality, service, service, facilities, and rooms that I could not beat at all! ! Great satisfaction at all. Please do not hesitate to give special thanks to the two staff members in the Executive Lounge, in particular. Foreign staff Mr. W who talked a lot to the 1-year-old son (Thank you for saying my son is my friend! ), The place where I live now is a flower in the local talk about the birthplace Thanks to Mr. A who bloomed, we had a very good time thanks to two people. thank you very much. In addition, when disturbing Osaka, I am lost with Ritz ... Laughs, and Conrad-san will surely bother you! I used Conrad for the first time in a 3-day stay for 2 days to watch the Grand Sumo Osaka area. Even though the lobby counter is empty, the hotel staff just greet me with a big bag and there is no guide. Not in the Executive Lounge, but in the lobby, it was handled by a poor foreign staff, and I stood for over 10 minutes and checked in. There was also a description of the Hilton owner's benefits, which prompted them to register and consented, but the executive room's benefits were not fully explained, the room was called for turndown, and the gym and pool could not be used. In the first place, when I checked in with a large bag, I found myself to go to the room by myself searching for an elevator, so it would be a hotel with a high threshold for a first-hand customer, and I was disappointed with the people who arrived. did. The Executive Lounge was always crowded and cocktail time was to wait in the room until there was a seat. There wasn't much worth waiting for, and there were few types of dishes and drinks, so I could not catch up with replenishment, so it was a pity I just felt stress rather than relaxing. The tea time was the same and I could not even see the cake. I saw several pairs of people checking in at the lounge, but with the courteous response of the staff, the guests were smiling and peaceful, so my handling became miserable and sad. The room was spacious and clean and functional and satisfied, but on the second day the large windows were completely white with condensation and the scenery was disappointing with almost no sight seeing. The salvage of this stay was that the breakfast restaurant was satisfying for the staff and the taste. If you want to use it next time, I think it will be with breakfast on the regular floor. Is it a land feature of Osaka? Is it the quality of the Hilton brand highest rank? Is the discount plan bad? The companions were always staying wondering. Staff of the staff who was kind Wakasu's staff "Please remember the hot water in the" Wakasu "" It was a guide of the upsell pretty good deals at the time of check-in, but the suite is an anniversary I am glad to see the familiar staff (Mr. K) at the last minute I will use it in etc. Experience our all-day-dining restaurant with live kitchen stations. This truly flexible space features open kitchens showcasing Asian and Western specialties with local ingredients from Osaka. Elegant dining and exceptional views await you. We serve teppanyaki and sushi with carefully selected ingredients and hospitality. The restaurant features a sushi bar that seats 9, four teppanyaki grills that seat 8 where you can watch the chefs showcase their skills. Enjoy authentic grilled seafood dishes from Osaka at C:Grill. Fresh seafood purchased from all over the world are presented here at the Conrad in a unique fashion. The seafood ice bar greets you at the entrance. The freshest selection from lobsters, oysters and Alaskan king crabs, to shellfish, are all displayed like art. Seafood grilled well is sure to stimulate your senses through its unique aroma. Enjoy the flavor of your dish to its fullest! 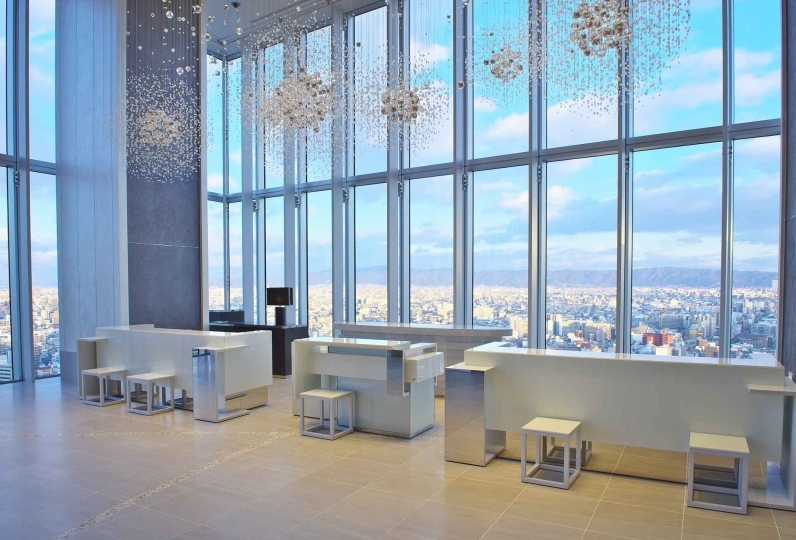 The Sky Bar & Lounge at Conrad Osaka is a welcoming lobby space adjacent to reception. Make the lobby lounge your meeting hub for a casual business discussion with a cup of delicious coffee or for talking with friends over cocktails. You can even enjoy the live music if you're going solo. A 24 hour fitness gym on the 38th floor outfitted with the latest equipment. There is also a 20 meter indoor heated pool, gym, sauna and jacuzzi. Take a moment and enjoy the spectacular view of the city. 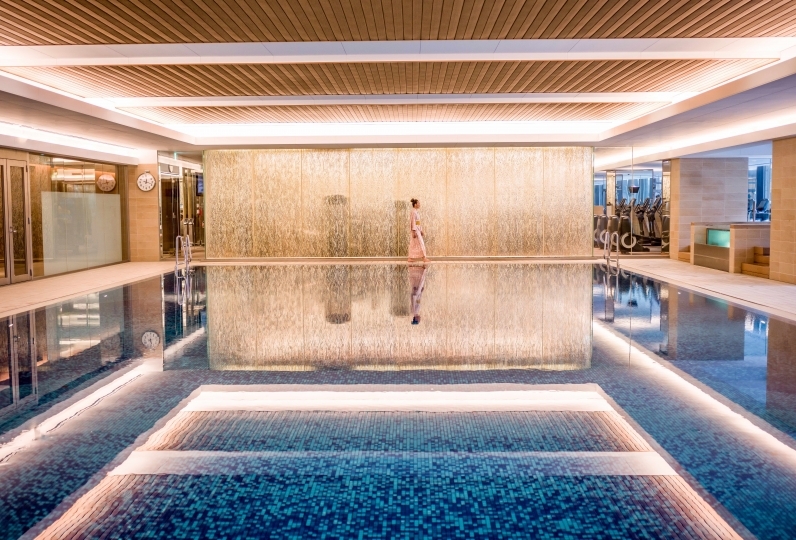 The Conrad Spa creates beauty and wellness through the fusion of traditional methods and advanced European methods. The stones used in the spa will give you its healing energy. All Executive room and suite room guests have access to the 39th floor Executive Lounge where you can check in and check out. Throughout the day we offer breakfast, afternoon tea, and cocktails so you can relax  at any time. *(Pool) Children under the age of 16 will require the presence of an adult (Over the age of 18). *(Gym Area) Children under the age of 16 are not permitted in this area. A city tax is included in the room rate effective January 1, 2017. The city tax ranges from JPY 100-300 per person, per night based on the nightly room rate. The tax does not apply to nightly rates under JPY 10,000. Please note that further exemptions may apply. For more details, please contact the office using the information on the reservation confirmation received after booking. Airport shuttle bus: 50 minutes from the front side Osaka Station. 75 of people have viewed this page within the past 24 hours.